Comfort is the most important characteristic of a long-distance cyclist’s equipment. Suspension improves comfort significantly and there are some new ways to have front suspension on a road or gravel bike. I review the Specialized FutureShock fork that the latest Roubaix and Diverge bikes are equipped with plus the RedShift ShockStop stem that can be fitted to any bike. I also list some aftermarket gravel bike suspension forks and discuss the effects of lower tire pressure. I’ve ridden a fair number of road bikes from several brands, made of various frame materials and have never noticed a major difference in comfort between different frames once I matched my riding position, the contact points (saddle and bars/tape/grips) and the tire model and pressure. That’s partly why I normally don’t bother test-riding bikes before buying them; instead, I look at the geometry chart to know whether I can obtain my desired position and I look at the specifications to know about compatibility of the components and accessories that I want to mount. When Specialized added a ‘FutureShock’ suspension fork to their Roubaix road bike in late 2016, I was finally interested in test-riding a new bike. I was immediately impressed because despite giving only 20 mm of front suspension, it massively improved the front-end comfort of the bike. The FutureShock operates by the upper section of the fork that the stem is clamped to compressing into the main part of the steerer column that the headset top-cap is clamped to. 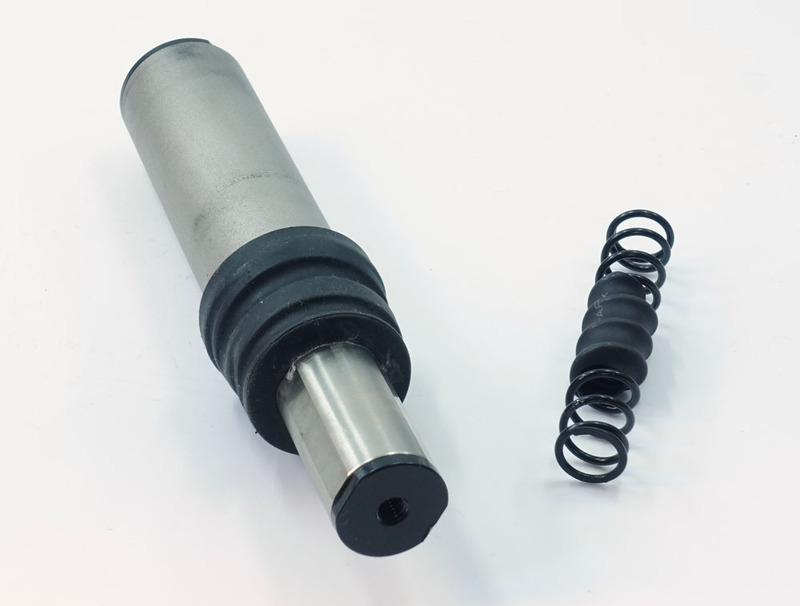 The shock absorption and damping is handled by an internal spring, pictured on the right, which is contained inside the catridge that is also shown. You can read more about it at Specialized.com or watch their video below. An unexpected bonus of the Roubaix’s suspension is how much it improves stability and confidence on rough downhills – instead of the front wheel bouncing over small bumps, I noticed how the wheel stayed in contact with the ground, giving better stability and more consistent braking and overall control. The additional weight of the FutureShock system is only about 200 grams, so that certainly isn’t going to make a significant difference to overall speed (see the page on Weight in the Determinants of Speed section) and is more than offset by the advantages. I was sold on the FutureShock system, but the Roubaix wasn’t the bike I wanted, I knew it would be even more of a benefit on a gravel bike that could take wider tires (the maximum tire width on the Roubaix is about 32mm). The Specialized Diverge gravel bike was due for an update and the previous version already offered mounting points for a rack and fenders on some models, so I waited until the Diverge FutureShock was available. The FutureShock consists of a special fork and headset, so it cannot be retrofitted to other bikes. For suspension that can be retrofitted to standard road and gravel bikes, see the sections below on aftermarket stems and forks. I’ve done similar rides on regular road bikes and on hardtail mountain bikes, each of which are more adept for certain sections of these mixed-terrain rides. In comparison, the Diverge feels reasonably fast on smooth surfaces even with 35mm gravel tires and doesn’t lose much to a mountain bike on most of the trails that I ride (and with my cautious MTBing style). I can’t imagine any other single bike that is more suited to this kind of varied riding. Having a small amount of front suspension is a real game-changer for a gravel bike. The only downside that I noted when riding the Specialized Roubaix FutureShock was that there was some brake-dive, with the suspension compressing noticeably under light to moderate braking. It wasn’t really a problem, but the sensation bothered me. Also, when standing up and dancing on the pedals, the shock compressed and bobbed slightly, but not by much. Fortunately, because the Diverge is designed to be ridden on far rougher terrain, the spring in the Diverge’s FutureShock is a bit stiffer and I have rarely noticed any brake dive on the Diverge and no bob when standing up. When riding the Diverge on smooth roads, it’s hard to notice that the FutureShock system is even there until hitting a real bump, when it performs as well as 20 mm of suspension can. All of the FutureShock bikes are fitted with a standard-strength spring installed, but are also delivered with two more springs, one that is firmer and one that is softer. I’ve found that the medium firmness, stock option works well for me on the Diverge (I weigh about 67 kg), but in fact the softer spring doesn’t feel all that different. In addition to the increased comfort and confidence-inspiring bike handling that the FutureShock suspension system offers, Specialized even claim that the FutureShock improves speed. They don’t state exactly how rough the road surface needs to be for the FurtureShock system to make a significant difference by soaking up the bumps so that they don’t sap momentum, but I’m sure that it helps me on most of the rides that I do with this bike. There are versions of the Specialized Diverge FutureShock with an alumnimum frame starting at US$1800 or a carbon frame starting at US$2100, but the versions available and prices vary greatly based on country, see Specialized.com. The aluminum frame has slightly less tire clearance (up to about 37mm instead of 40-42mm in the carbon frame), so I chose the carbon version because I wanted to fit 35 mm tires as well as full fenders. There is also an S-Works carbon version, which is a few grams lighter for far more money and so is certainly not worth it. I won’t comment further on any specific version of the Diverge because I sold most of the stock parts and installed my preferred components. My bike now has Shimano Ultegra Di2 gearing with an 11-40 XT cassette and 33-46 chainrings, Avid BB7 mechanical disc brakes, custom wheels with 28/32 spokes front/rear, and LOTS of accessories. To make this a more complete review of the Specialized Diverge frameset, I should comment on the other noteable aspect of the Diverge frame, which is the lowered bottom bracket (BB). This is a nice feature when using 35+ mm tires on the Diverge because the BB height is then similar to that of a road bike with 25 mm tires. I don’t ride technical terrain or hop over logs, so I often find that the BB on my hardtail mountain bike is unnecessarily high. The lower BB on the Diverge is therefore a good thing when setup in gravel bike mode. When using the Diverge with 25-28 mm road tires, the bottom bracket of the Diverge is noticeably lower than on a typical road bike and pedal strikes when turning are certainly possible, even with my short 165mm cranks. Once you’re aware of this, it’s not really a problem. I’ve been even happier with the Specialized Diverge FutureShock than I expected to be. I hoped that it would be a great gravel bike and that is certainly the case and I’ve pushed it to the limit in that regard, but I’ve discovered that it’s also an excellent endurance road bike. The extra comfort of the front end is excellent and it feels very similar to my all-out racing bike when I use narrower tires. To make space for my new Specialized Diverge, I sold the bike that I used for my previous bikepacking race, the Transcontinental Race in 2016, which was a Ridley Fenix SL, so I wasn’t sure what bike I’d use for the TransAtlantic Way road bikepacking race that I plan to do in 2018. I was thinking of ordering a custom road bike frame with S&S couplers so that I can divide the frame into two to make plane and train travel cheap and simple. I was expecting the Diverge to remain as my all-road / adventure / gravel bike. Unexpectedly, I was so happy riding the Diverge on all sorts of rides that I decided that it should also be my race bike for the TransAtlantic Way. It can take all of the accessories that I want and it’s extremely comfortable on the road even with fast 28 mm tires installed, so that will be my setup. Not everyone can afford a new bike or wants a Specialized Roubaix or Diverge. Fortunately, there are suspension options that can be added to any bike, with the RedShift ShockStop stem being an excellent option. For a variety of reasons, in late 2017 I ended up with a previous-generation Specialized Diverge gravel bike from 2015 that doesn’t have the FutureShock. I read good things about the RedShift ShockStop stem and so I was interested to see if a standard road or gravel bike could be upgraded to have the level of comfort that my Diverge FutureShock has. Fortunately, RedShift were happy to give me a stem to test so I put it on the 2015 Diverge to compare the comfort it offered to the 2017 Diverge FutureShock. The ShockStop stem pivots just in front of the clamp around the fork steerer column and the rotation is damped by elastomers inside the stem. Maximum travel is 20 mm (this partly depends on stem length and handlebar style). The movement is mostly vertical but at the same time as the bars move down, they rotate slightly due to the pivoting motion (see the animation on the product page). The stem weighs about 150 grams more than a decent-quality stem of the same length (my 100 mm version weighs 283 grams). Various elastomers (the colored pieces in the photo on the right) are delivered with the stem to adjust the suspension stiffness, with 15 different combinations being shown in the manual. As an average-weight rider (67kg) using drop handlebars, I initially installed the recommended 70 & 60 elastomers, but I found this to be far too soft for my liking. Changing the elastomers is not difficult following the clear instructions, so I went up two steps to an 80 & 70 combination. I expected the change to be subtle but found it to be a bit too much and the stem was rarely compressing, so I settled on 80 & 60. I was surprised by how much difference there was between each step. With the elastomers chosen to my liking and to somewhat match the stiffness on the Diverge FutureShock with the medium spring, the RedShift ShockStop stem certainly makes the ride over dirt roads a whole lot more comfortable and happily it doesn’t have much effect when riding on smooth roads except when a real bump is encountered. There is a small amount of brake dive and there is some movement when standing up on the pedals, but these effects are both subtle and not really a problem. 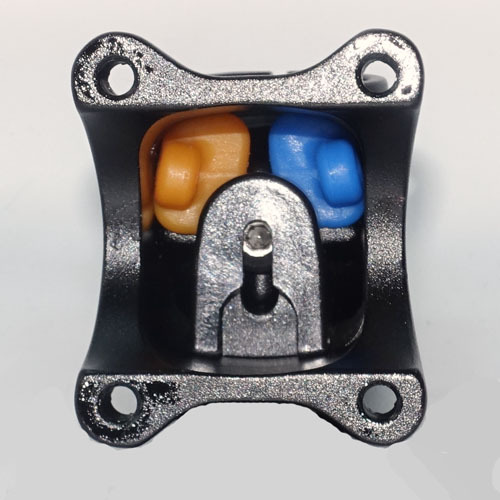 The ShockStop stem is extremely well made (like all of the other RedShift products that I’ve used) and I believe RedShift when they say that the pivots will not develop any play over time. The additional comfort offered by the ShockStop stem is excellent and I’d recommend it to anyone looking to improve the comfort on their road or gravel bike, which is especially useful for long-distance riding. It again has the unexpected benefit of giving more stability and confidence on rough descents by keeping the front wheel in more continuous contact with the ground. It costs US$140 (without tax) direct from their US website or 150 euros (including tax) from the German importer. In the early days of mountain biking in the 1980s and ’90s, several suspension stems were available. 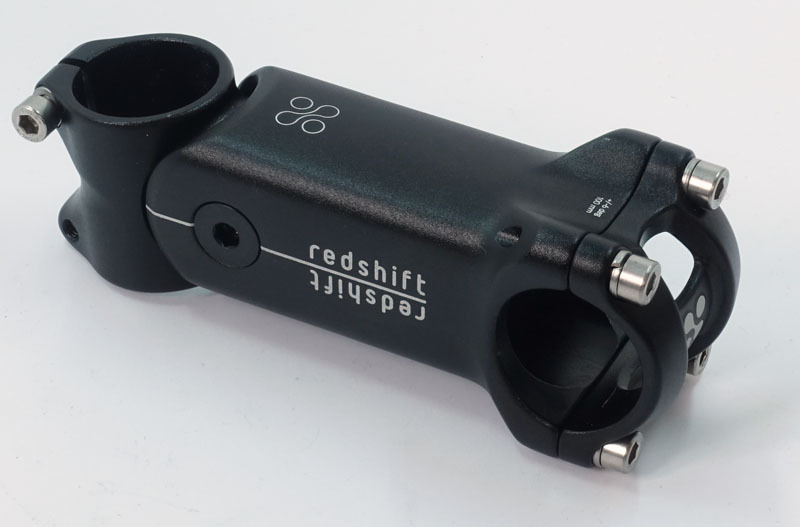 Due to being primarily designed for road riding (but still rated for off-road use), the RedShift ShockStop stem has less travel, is much lighter and has better pivots and than those early designs. More modern options include the TransX AntiShock stem, but that gives less than 5 mm of travel, and the Sta-Fast Air Sprung Stem, which was much bulkier and heavier and doesn’t appear to be available anymore. Despite my very positive experience with the ShockStop stem, I’ve noticed two important differences between the suspension given by the Diverge FutureShock fork and the RedShift ShockStop stem. First, the suspension given by the ShockStop’s elastomers doesn’t feel as progressive or refined as does the spring in the FutureShock. Second, the fact that the bars rotate slightly as the ShockStop suspension compresses does feel slightly odd when riding on the brake lever hoods of dropped handlebars; in contrast, the angle of the bars is maintained with the FutureShock system. Both of these differences are subtle and are not really criticisms of how the RedShift ShockStop stem has been designed or produced, they are just inherent limitations of this type of setup. Using the ShockStop stem would still massively improve the front-end comfort of any road or gravel bike. Obviously, it’s not a replacement for a true suspension fork on a mountain bike. There are a few after-market suspension forks designed to be added to standard gravel bikes and are starting to be sold on complete bikes from a few smaller brands. These won’t work on all bikes due to needing to match the headset bearing sizes and having clearance under the down tube and they may change the bike’s geometry slightly. Although these forks are 500 – 1000 grams heavier than a rigid fork, they do give more travel and probably more effective suspension than the offerings of Specialized and RedShift. I haven’t been able to try them myself (except for a very brief ride on a Cannondale Slate), but they generally lean a bit more towards an alternative for a cross-country mountain bike than an alternative to a road bike. The Fox 32AX (see this BikeRadar review) and MRP Baxter forks give 40 mm of travel and are basically MTB forks with modified internals to fit on many (but not all) gravel bikes. The Lauf Grit fork (see this BikeRumor review) is a bizarre-looking but apparently effective all-carbon model that has 30 mm of travel; it doesn’t have the down-tube clearance issue that the modified MTB forks may have. There is also the Cannondale Slate bike with a Lefty suspension fork that has 30 mm of travel. Back in the early 1990s, RockShox made a fork with 30mm travel that was used by many pro’ teams for the brutal cobbles of Paris-Roubaix. Despite 3 race wins, the fork fell out of favor and was never really offered on consumer bikes, read more at BikeRadar. RedShift explicitly state that their ShockStop stem can be used with aerobars and emphasize how much comfort it gives in that scenario. Specialized make no comment on this, but I’ve ridden extensively on aerobars on my Diverge FutureShock and the suspension has performed well in making the ride more comfortable while most of the time it’s not noticeable that the system is there. Most adventure / all-road / gravel bikes are designed to be comfortable and some brands give impressive-sounding names to the technology used to achieve this. However, if the frame and fork are essentially rigid parts then there is never going to be a massive amount of vertical flex possible. Trek sell road and gravel versions of their Domane bikes that have an ‘IsoSpeed’ system in the front and rear. This allows the fork to pivot back and forth slightly to provide a very small amount of vertical compliance. Specialized argue that this is a poor method of achieving the goal because the movement is in the wrong direction – it should be vertical. If wider tires fit in the bike’s frame, fork and brakes then using them with lower pressure will certainly improve a bike’s comfort and this is one of the most noticeable changes that can be made to a bike. However, the type of suspension offered by the air in the tires is quite different to that given by the true suspension systems described above, and is generally much less effective and cannot be controlled so easily. I therefore prefer the more direct methods of suspension and I find them to be far more effective; in addition, they have fewer performance downsides. There is currently a lot of debate about what tire widths and pressures give the best efficiency and performance. The traditional assumption was that wider tires at lower pressures were slower than narrower tires at higher pressures due to extra rolling resistance caused by lower pressure tires deforming more. Recent research shows that what is lost due to more tire deformation may be more than made up for by fewer suspension losses in that the bike can keep rolling forwards more smoothly if the lower pressure tires can absorb small bumps better. Knowing exactly where the optimal point is in this resistance trade-off is a difficult thing to estimate and varies based on the road conditions. Some people claim that very wide tires with even lower pressures are even more efficient (e.g., Jan Heine who sells such tires), but there is very little independent testing that supports those claims. Wider tires certainly have a slight aerodynamic penalty and once the tire is more than 5-10% wider than the external rim width then a lot of the gains of aerodynamic rims are lost. Such differences are small, but so are the differences in rolling resistance that are caused by tire width. Trying to stay on the topic of front-end comfort on road and gravel bikes, using wider tires at lower pressures will certainly make a noticeable improvement, but having a proper suspension system like the Specialized FutureShock or RedShift ShockStop is far more effective and has virtually no possible efficiency detriment, so this is my preferred method of increasing comfort on the front of my bike. I’ve focused on ways to make the front of a road/gravel bike more comfortable. There are various ways of giving more rear-end comfort, including having a carbon seatpost designed to have extra flexibility/shock absorption, having a frame with a lower seat-post clamp to allow more of the post to move, using a seat post that contains a spring or elastomer shock, and a few road and gravel bike frames have built-in suspension systems. Plus, there is again the option of lower tire pressure. However, this is the topic of a whole other article and this one is already more than long enough. Let me know in the comments below if you have experience with any these front suspension options or any others that I have neglected. Excellent review of the bike and components plus your findings from riding with them. I’ve been on the fence about this particular bike along with a couple of others but I think I’m sold. Your gearing is a personal choice for your type of riding and abilities but i was very curious why you chose the brakes (Avid BB7). Was there a particular reason? Again thank you for the review and fantastic video. Hi Richard. I’m a professional bike mechanic, but I don’t like messing with hydraulic brakes on my own bikes, both road and mountain. I therefore use mechanical disc brakes. I’ve found the TRP Spyres to be pretty rubbish – not much power and the pad position keeps going out of adjustment on two separate pairs that I’ve tried. The Avid BB7 road and Shimano CX77 are both great road mechanical disk brakes – easy to adjust and they give plenty of power. I had a Spyre on my Audax bike but the bulky size of them ever so slightly interfered with the spokes of my SP dyno hub so on the rear it went. After 12 months it seized only to find the inner mechanism a blob of corrosion. I’m also riding with BB7 roads and have no problems with stopping power. By the way did you get to try the carbon version for comparison? Hi Chris. Previous post I meant to ask if you tried both alloy and carbon versions and if so could you find differences in the ride. I’m not completely sold on alloy being harsh when you ride with wider tyres. I totally agree. Tire pressure, saddle and hadlebar tape all make a far bigger differences to a bike’s ride quality than does frame material IME. If the aluminum Diverge Future Shock had sufficient clearance for fenders and was offered in a reasonable colour in my region (not just baby blue) then I would have taken it. I didn’t buy the carbon version for the weight or comfort advantages. Thanks very much for your thoughts on the Redshift Shockstop stem – I ordered one and put it on my gravel bike and the difference in comfort is astounding, also on the road. It certainly won’t be coming off. Why more people don’t use them I don’t know! Great artcle. Very informative. Curious, did you ever try the Redshift stem on the Diverge with the Future Shock? Wonder what the combination would be like. Nope, I’ve never tried the double-shot with that combination. Maybe one day soon I’ll give it a try. Thanks so much for your informative article and great video. I’ve just bought the Diverge E5 Comp (women’s model) with Future Shock and so far I love it. I have a carbon road bike and the Diverge is my bike for getting off roads, so I’ll be using it mainly on gravel and single-track. My bike came with the medium Future Shock spring but the effect is so subtle (I wasn’t sure it was working at all) that I’m going to try the soft spring. You said there’s little difference between the two, but I’m light (55 k) so I’m wondering if a lighter-weight person would need a soft spring to get the same effects as a heavier person with the medium spring. Right now I have the larger cap at the base of the future shock along with two spacers (bike shop set it up this way), but I read a post somewhere that said that the spacers inhibit the performance of the Future Shock spring. My question for you is, do you think the spacers blunt the action of the Future Shock? My local bike shop isn’t a Specialized shop and couldn’t answer this question. First, I cannot imagine how the number of spacers could affect the FutureShock effectiveness – I’ve never heard that mentioned by Specialized or anyone else. Second, given your weight I would definitely recommend using the lightest spring.